Choosing the right college is a big step toward your child’s future career. A “good fit” college gives your child the tools to succeed academically and the extracurricular activities to support a well-rounded college experience. That dream college also needs to fit into your family’s financial situation to make it affordable for the four-year program. Selecting a college comes down to deciding what your child wants and needs, and finding a university that fits those traits. Many students begin the college search during their sophomore or junior years of high school, with the process kicking into high gear early in their senior year. The decision should ultimately be made together – it’s your child going to college but you are (presumably) helping pay for their education. There are several ways you can help your child through the college selection process. Check out our tips for choosing the right college to get your child on the right track. Several factors go into the college selection process. Students often get caught up in specific factors like where their friends are going, which campus has the coolest facilities, or which schools have sports teams they can cheer for. If you’re wondering how to help your child choose the right college, one of the best things you can do is point out the additional factors that go into making a smart choice, and help your child figure out how different colleges line up with their preferences. Some kids want to stay close to home for college. Others want to put several states between themselves and home. Where does your child fall on the scale? Don’t take it personally if your child starts searching for colleges far away. Some kids want the adventure of living in a state far from home where they can exert their independence. Either way, distance is a factor to consider when comparing colleges. A school that is within driving distance to your home can save you significantly on travel costs. One option is to have your child live at home and commute. However, living at home means your child may miss out on the full experience of living on campus and being out on their own. Some students want the option of feeling independent by living in dorms; others prefer the comfort of home and being able to save money by not having the added expense of the room and board or meal plan fees. An in-state public college, meaning a college that is within the state you reside, is generally more affordable than a state college located in another state. Most public universities charge students significantly more for out-of-state tuition, so keep this in mind if your child is considering a move to another state. Either way, staying within driving distance makes it easier for you to visit your child and for your child to come home for the weekend. If your child wants to go to college in another state or even across the country, consider the cost of transportation. Make sure your child is okay with only coming home during longer breaks. Whether near or far, consider the college’s city in addition to the distance away from your home. What does the city have to offer? Is it a large or small city? Is the college located in a safe part of town? Does the area offer facilities and entertainment that your child enjoys? The surrounding area can affect how your child feels about the college, so it is important to visit the school, if possible, to make sure you and your child have a good understanding of what the surrounding area is like. Rural areas and small towns often have limited options for shopping, entertainment and other facilities, and may leave your child feeling bored. On the other hand, large cities can feel overwhelming if your child isn’t used to urban areas. Consider the college’s proximity to grocery and drug stores. If the campus is remote, will your child have access to public transportation or a personal vehicle to get to the store? In some cases, your child’s major plays a role in choosing a location. A location near the ocean makes sense for a marine biology major. A rural area works well for agriculture majors. A student who wants to study politics may enjoy a campus near Washington, DC. Colleges in other areas may provide excellent education, but the location can enhance the college experience if your child has a plan in mind. Check out the enrollment numbers at the colleges your child is considering to see if the size matches up with your child’s preferences. Small colleges offer an intimate experience with the opportunity to get to know many fellow students and faculty. Your child may receive a more personalized education and gain access to opportunities like internships or jobs thanks to their connections with faculty and staff at the college. While some kids enjoy that close-knit feeling, others may prefer a little more anonymity at a larger college. Universities with larger enrollment may also have more program offerings available for students. They may also have more opportunities for significant research, and generally have enhanced school spirit. The physical size of the campus is another factor. Large campuses typically offer more facilities and specialized buildings for different areas of study. However, your child will spend more time walking across campus to reach those facilities, or may even have to take a bus to class. Smaller campuses are easier to navigate, but they may feel cramped if your child prefers a larger school. Large and small campuses each come with distinct benefits and potential drawbacks. There is no right or wrong choice. The decision boils down to the size that makes your child feel comfortable and best able to learn. Colleges vary in admissions requirements and difficulty level. Ivy League colleges carry a reputation for having rigorous selection processes and coursework, but other colleges can be just as demanding. Is your child up for the challenge? Can they handle the pressure? Does the school have a support system in place if they need assistance with academics? Being challenged and pushed toward excellence is important, but your child also needs the tools to succeed. Colleges are often described as target, reach or safety schools. You would be prudent to check your child’s stats (GPA, test scores, etc.) to the average student at any given college. Reach schools are more challenging and difficult to get into, while safety schools give your child a high chance of acceptance. Finding the perfect school often comes down to the right balance of academic challenge and support for success. If your child does decide to apply to a rigorous school, help them keep a realistic attitude toward getting in. Many well-qualified, highly intelligent students receive rejection letters from colleges. You don’t want to discourage your child from applying to those challenge schools, but you also don’t want them to be crushed if they don’t get in. Does your child have an idea of a preferred major, area of study or career path after college? These preferences have a major impact on college choice. Not every college offers every major. Smaller schools often have a limited number of majors and programs available, which may not line up with your child’s future plans. When considering colleges, review the options for programs of study before making any decisions. While various colleges offer a wide range of majors, some colleges are best known for a handful of programs. A university might have a strong focus on teacher education, accounting or agriculture. Certain schools may offer a top-notch pre-med program. If your child is certain of their career path, give strong consideration to schools that are known for that particular program of study. Some programs are highly competitive, so your child may not be guaranteed a spot in the program. You’ll want to make sure to research how competitive the desired program is for each of the schools your child is applying to. An engineering focus, for example, significantly increases the selectivity of a certain college. Another factor is the type of careers students find after graduating from a particular program. Does the college have a high rate of employment upon graduation? College is an investment in your child’s future, but it needs to be one that your family can feasibly afford. Tuition is only a small part of the puzzle. When comparing the finance of your child’s top picks, look at the tuition, room and board, and additional fees. If your child plans to live off-campus, do research on the typical rental cost in the area near the college and the cost of parking or commuting to campus. Private colleges are almost always more expensive than public universities, however, many private colleges offer generous scholarships for accepted students which may not be available at a public university. If cost is a major factor in the decision, it may be best to compare a variety of public and private colleges to see which option would be a good fit for your child. 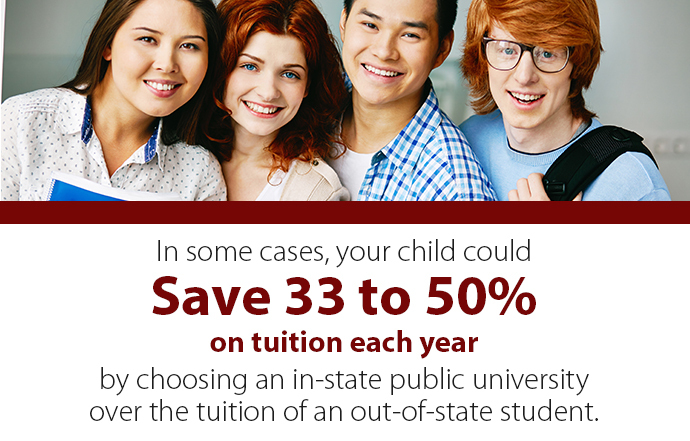 In some cases, your child could save 33 to 50 percent on tuition each year by choosing an in-state public university over the tuition of an out-of-state student. However, it’s important not to eliminate a college completely based on cost. Seeing the cost of tuition, fees, and room and board can cause sticker shock, but a robust financial aid package and a good college funding strategy can help the costs fit into your budget. Academics are a huge focus of the decision, but the college experience is more than just going to class. Students don’t have to give up their interests and hobbies when they go to college. Find a university that offers a way to continue those interests to help your child stay balanced during college. Research the extracurricular activities available on campus. Colleges may offer intramural sports teams, academic clubs and student organizations. Greek life is a popular option at many college campuses. If your child has a particular hobby or passion, check to see if there are any extracurricular options that match their interests. A club related to your child’s major can also enhance the college experience in addition to providing an outlet for them to make new friends and connect with other students. For example, some colleges have criminal justice clubs that supplement the criminal justice curriculum. Larger colleges tend to have more options for extracurricular activities, but no matter which college or university they choose, there will be some options available. If your child plans to work to pay for college expenses or earn spending money, it may be helpful to check on the campus job opportunities. Some colleges have plenty of student employee vacancies. Others have limited options reserved for students who qualify for work-study. If your child lives on campus, having a job that is also on campus is the most convenient option. In some cases, the jobs relate to a particular major. A student majoring in library science may land a job in the campus library. An education major may get a job as an assistant for the education department at the college. Those specialized jobs are often highly competitive, so your child may have to consider general jobs like working in the dining center. Help your child to research the jobs that may be available and see how competitive those jobs are in order to help your child evaluate the prospects. First-year students often live on campus in the dorms. Some colleges make it a requirement for students to live in the dorms for at least one year. Look at the dorm options at each school. Certain dorms may be limited to upperclassmen. Co-ed dorms are common, but some colleges may have dorms designated only for male or female students. 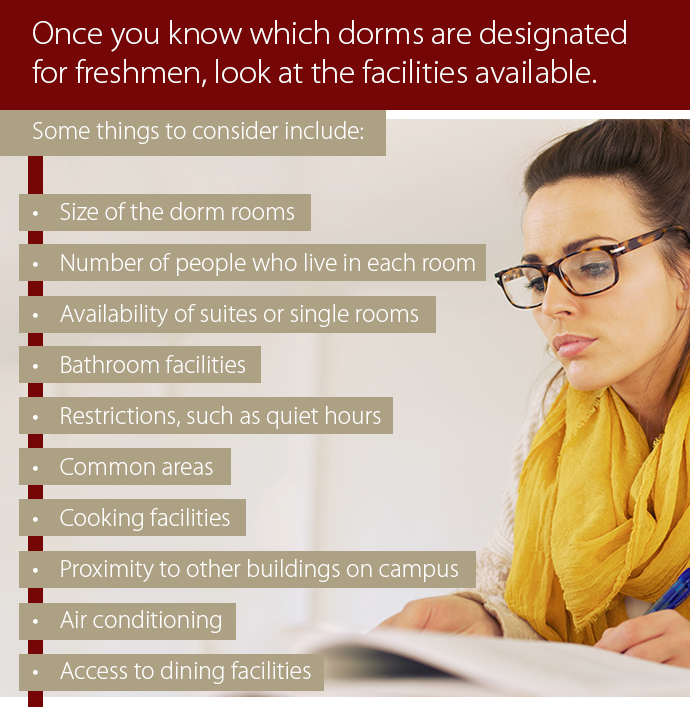 Talk to your child about the type of dorm situation that sounds most appealing. A dining plan is often required for students who live in the dorms, so take a look at the meal plan options as well. Beyond the physical facilities, the school should make your child feel comfortable and safe. Can your child be themselves without being criticized or judged? Is the campus well-lit and safe if she goes out after dark? The overall vibe of campus life should mesh well with your child’s personality and preferences. Once you decide on your preferences for the various characteristics of colleges, you can start narrowing down the options. You can’t make the decision for your child, but you can help your child choose a college by being supportive and helping with the research. One of the best ways to get a feel for a college is by visiting. Seeing the campus in person is often quite different than looking at it in brochures or on a website. Your child gets to feel the energy of the school and see the facilities in person, and you’ll be able to see how welcoming and friendly other students and staff are to visitors. When planning college visits, consider which schools are real possibilities. If a college is well outside your comfortable price range or it doesn’t have specific programs your child is seriously considering, consider whether it would be worth the trip to visit the college and if your child would realistically be able to attend the university if they’re accepted. It’s easy to get caught up in the beauty of the campus and the excitement of the campus tour. Your child may fall in love with a college that just isn’t a great fit for any number of reasons. While you’re on campus, talk to as many people as possible, and experience as much of the campus as you can. Eat at the dining facilities and check out the library. If possible, visit while school is in session, so you can see the campus in action. Go into the college visit with an open mind, but be prepared to evaluate the campus with a critical eye. Have a written list of the things your child wants or needs in a college, so you can see if that specific campus checks all the boxes. Bring a list of questions to ask the tour guide or faculty in the admissions office. Take notes, if possible, so you can compare all the colleges you tour with your child. Who do you know that has attended the colleges your child is considering? Check with friends, family, neighbors, colleagues and acquaintances to find alumni. Ask them about their experiences as a student. If your child has older friends who attend the university, have them ask them questions. Contact the child’s parents to hear about the college from their perspective. Encourage your child to sit in on a lecture or two at the colleges they’re considering. This idea may be an option while on a campus tour. You can’t judge an entire school on one professor, but you can get a sense of the college’s overall attitude and expectations about academics. Another helpful option for evaluating a college is by having your child stay on campus. Check on this possibility while at the school for a campus visit. If your child knows someone who currently attends the college, consider having your child stay with that person for the night. If your child can’t stay on campus, it may be possible to stay in a nearby hotel during your visit. Spend as much time on and around campus as possible at various times of day. This experience helps your child see if the college is a good fit around the clock. Ultimately, the choice of colleges is your child’s. Of course you have some say, particularly if you are handling the finances, but your child needs to feel comfortable and excited about the selection. Even though you may have strong opinions about a certain college, it’s important to let your child form opinions without a heavy influence from you. Help your child identify the important factors in choosing a college, and then take a step back. If your child falls so in love with a campus that she doesn’t see the drawbacks of the school, you may need to step in and point out those issues. Look at the full financial obligation of the colleges your child is considering. Pull up a list of all the costs, including room and board, tuition, fees, parking and an estimate for books. Determine what your financial obligation will be for each college when you factor in financial aid, scholarships, grants and other funding sources. Also factor in things like transportation. If your child chooses a school on the other side of the country, you will have airfare to pay each time your child returns home or you visit your child. By calculating all the expenses, you get a better idea whether the school works financially. Calculating your expected family contribution will be a critical step in understanding which colleges you’ll be able to afford and ensuring that funding will be available for all four years of college, not just their freshman year. Starting with a large list of potential colleges gives your child several backup options if the first few choices don’t work out for any reason. Create a large list of schools that match certain criteria, such as location, size or certain academic programs. Some schools may be eliminated right away due to cost or another deal-breaking factor. The remaining schools are the ones you want to investigate further through visits and research. Aim for about 6 to 10 colleges on your child’s list of serious contenders. Encourage your child to choose mostly schools that are a good fit all around. It’s a good idea to include two or three “safety” schools as a backup. If your child has a few colleges in mind that could be out of reach, it’s okay to apply. You never know what kind of financial aid package your child may get or if their application will get approved, even if the admissions process is rigorous. Visit and apply to those schools, so you have a good base for comparison. If you only visit one or two schools, you and your child may not realize what else is out there. You may miss a college that is a perfect fit by settling for a college that has some of the preferred qualities. As you start visiting those schools, you may decide to cut some right away. Perhaps your child doesn’t get a good vibe while on campus, or the college isn’t located in a great area. You can eventually focus on your child’s top picks before making the final decision. No matter where you are in the college selection process, now is the time to start planning the financial aspect of your child’s college education. Call Ecliptic Financial Advisors at 732-502-9700, or complete our online contact form. If you’re in the New Jersey area, register for one of our free workshops to learn more about the college admissions process and financial options. If you’re ready to get started on a plan for your child, schedule your appointment now. Our college funding strategists are ready to help you make your child’s college financially feasible for your family.